You know those nostalgic restaurants that you remember so vividly from your childhood? For me, Sweet Lorraine’s is one of those special places. I specifically remember ordering large sodas with my cousins. We would get so excited when the waiters/waitresses would give us colorful twisty straws and place miniature figurine animals on the edges of our glasses. While the kids’ menu had it all, I eagerly ventured over to the adult menu with encouragement from my grandma. She notoriously ordered the quesadillas, and loved them so much that she found disappointment when other restaurants’ did not live up to Sweet Lorraine’s quality. While the quesadillas are extremely good, I found other dishes that were bursting with flavor, such as their salads, pastas, and one of my all-time favorites, the “Spicy New Orleans Chicken and Shrimp Creole.” Sweet Lorraine’s menu has a slight Cajun flair, and the restaurant itself is filled with color and playful art that highlight music, drinks, and food. Sweet Lorraine’s quickly became one of my family’s go-to places to eat. My cousins and I are still big fans, even though our drinks no longer come with fun straws and figurines. As an adult, I’ve been able to try their generous selection of wine and beer, and I am always intrigued by their specials, which often feature seasonal dishes such as pumpkin soup and vegetable stew. 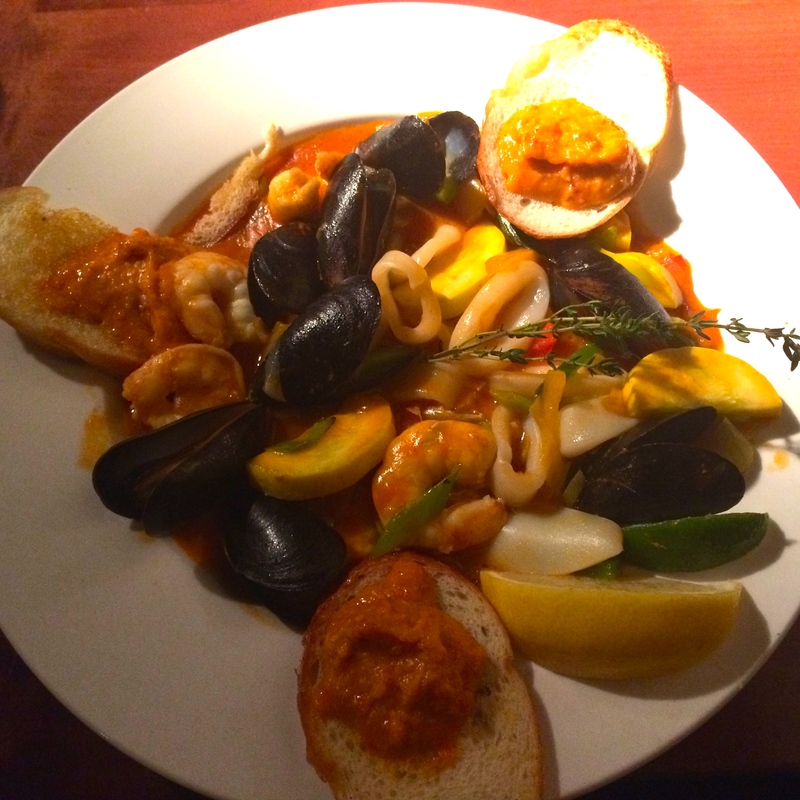 On my latest visit, I tried the seafood stew special, which came with shrimp, squid, and mussels in a savory tomato broth, served atop crab and lobster stuffed ravioli, with buttered crostini’s on the side. Can I get a “What, what?” It wasn’t the BEST seafood stew I’ve had, but I loved how the ravioli soaked up the broth. The seafood itself was a little overcooked, but still had lots of flavor. If you’re unfamiliar with Sweet Lorraine’s, you may have heard of their “Fabulous Mac N’ Cheez.” Sweet Lorraine’s has branched out and created several “Sweet Lorraine’s Fabulous Mac N’ Cheez” restaurants strictly dedicated to that gooey, cheesy bowl goodness that most Americans know and love. I have ordered it myself, and it does not disappoint. Sweet Lorraine’s serves up mac n’ cheese varieties such as truffle and mushroom, bLt (bacon, lobster, and tomato), and bacon n’ cheddar, putting your boxes of Kraft at home to shame. Sweet Lorraine’s truly has something for everyone, and it’s casual, yet classy. Their desserts are also worth it, but I usually settle for the melt-in-your-mouth dark chocolate mint truffles they serve you with your bill (not a bad deal). So make a reservation (yes, they take them), make sure you’re hungry, and head over there! Hours: Mon. – Th. 11:00 a.m. – 10:00 p.m.., Fri. 11 a.m. – 11 p.m., Sat. 8 a.m. – 11 p.m., Sun. 8 a.m. – 9:30 p.m.
View their website here for their breakfast, lunch, and dinner menus and more info! Homemade Hummus For The Win! And your grandma remembers it well. I always loved taking you to Sweet Lorraine”s but that first time with the twisty straws was the best! !